Our family and staff at Crawford-Osthus Funeral Chapel wish you peace and love this holiday season. We know that the process of adjusting to life without a loved one goes on long after the funeral is over. We understand the unique and ongoing challenges you might face, and this holiday season is no exception. The world around us is preparing for the holidays, and society encourages us to join in the “Christmas Spirit”. However, this time of year can bring pain and sadness to those of us who are grieving the loss of someone we love. 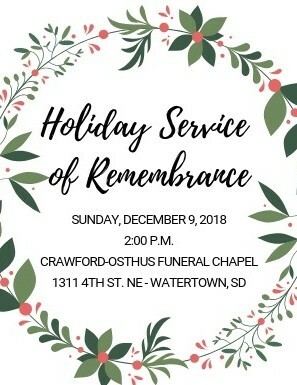 This season, we cordially invite your family to our Holiday Service of Remembrance on Sunday, December 9, 2018 at 2:00 p.m. at Crawford-Osthus Funeral Chapel in Watertown, SD. This service is designed for families to remember their loved ones in a special way, and to offer comfort, as well as a time for reflection. We will have a brief service in the chapel, led by a local minister, special Christmas music, and a video tribute, honoring those who have passed. Our angel tree will be shining bright, each angel representing a loved one lost by our families during this past year. Following the service, there will be a time for fellowship and refreshments in our fellowship hall. This event is open to the public. We kindly ask you to RSVP to this event by calling 882-1516. We hope that you will be able to attend this special service.